Hmm...how's your 401k doing? Yeah, mine too. But there's nothing like a great ramen to cheer you up! And guess what?...it did just that. Tonight's Umani Ramen was the perfect comfort food for a long, challenging day. You have two soup bases (shoyu & shio) to choose from. Both, I presume go well with umani, but since I had to choose one, I chose the shio. The best part of this ramen is its gravy-like consistency that is created by adding a little corn starch to the soup. The thickness coats your tongue and gives your taste buds a long, tight hug. 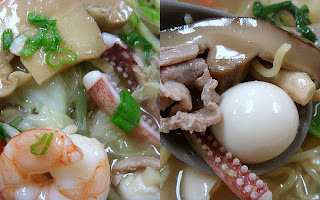 The massive amount of plentiful toppings are once again sauteed using the ramen soup before being loaded on top, thus creating a classic Umami that retains its intense heat and blows you away with freshness. I'll TRY to name all the toppings on my own, but if I miss one please correct me. (That means you Murakami-san.) Here goes: Shiitake, carrots, octopus, shrimp, enoki, quail eggs, takenoko, negi, cucumber, napa cabbage, regular cabbage, eringi, onion, pork, ginger, naruto, and a hanjuku tamago. Whew, that was a mouthful! Whenever Murakami-san creates a new dish, he always tests it with his employees who then provide honest feedback so the dish can be perfected before it reaches the customer. Today I had the honor of trying one of those dishes myself. This dish is so spanking new that he still hasn't figured out what to call it. It's chicken. And it's prepared using a relatively lengthy process. It begins by being boiled in soup stock containing several herbs and spices along with the 3 G's: Garlic, Ginger, and Green Onion. Once the chicken is fully cooked, it is strained out of the soup and rapidly cooled with ice water. The remaining soup is then filled with more of the 3 G's and used as a preservative. The chicken is then placed back in the soup and allowed to sit for 2~3 days. Then when the chicken is ready to eat, it is removed from the soup, flash-fried for 30 seconds, and broiled until the skin becomes crunchy. The result is this juicy, brown, tender, crunchy piece of chicken that goes great with anything, especially beer. I think it's definitely ready for the menu! I don't know what Murakami-san will end up calling it, but for now I'll call it "Chicken-3G" because of its 3 main ingredients, its 3-step cooking process, and its next generation feel. As I was finishing up my 3G chicken, Murakami-san brought out another sample of a dish that only the employees get to eat. I don't exactly remember what it was, but the sweet and sour pickled flavor of the cured fish really hightened my senses. And thanks to Murakami-san, I have a container full of it just chillin in my fridge. It's been awhile since I've had the miso. I think I'll choose the miso base tomorrow. That nanbanzuke looks really good. Can you freeze some and send it over? BTW, Jyangara Ramen moved down the street from my office. Zenbu iri here I come! Another excellent review! :) Wasn't the Umani just... massive?! (O_O) It was so gigantic I couldn't finish it. That 3G Chicken looks so delicious! Lucky! :) I hope Murakami-san adds it on the menu soon; I'll have to order it when it's available! I agree. That 3G chicken sounds really good. Murakami-san really needs to open a Foo Foo Tei closer to Irvine! Ha! Ya I think a Foo-Foo in Irvine would do really well. Maybe we can convince him to open one someday! South OC could use a good one.